Currently in development: An online application for CAMD members to manage their own event attendance, and organisers to manage overall event attendance and details. My personal production company, where I pursue technological avenues that show promise – such as development of the browser game Locusts. WordPress is used to provide this community group with an interactive online hub. HTML5, CSS3, PHP, WordPress (including Facebook integration), MySQL, Eclipse, Paint.NET, and Photoshop. Development of a secure web application to automate and integrate church administration. The core functionality of this application is similar to that of OnValue listed below. 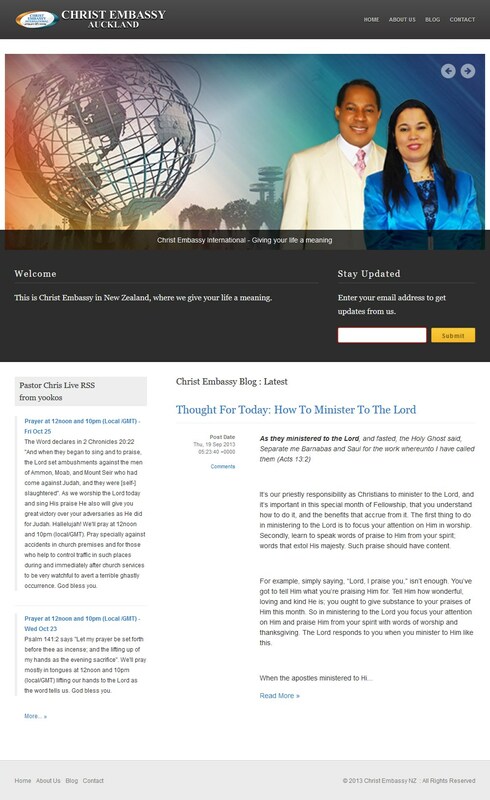 Adapting and augmenting a template for use as this organisation's public web presence : screenshot of christembassyauckland.org, 26th Oct 2013. Construction and maintenance of this organisation's interactive map, and enabling members to update its content via training materials and a straightforward interface. Enabling the assessment and formal presentation of real estate's market value via a secure web-based interface. Summary of my work on OnValue (1.5MB PDF file) – OnInspection was a subsequent iteration based on this concept. Construction and administration of the websites for two of Manawatu Summer Shakespeare's annual productions. Site revision and maintenance for the Palmerston North based $lave Musicians' Collective. Translation of German lyrics in David Bowie's "Helden / Heroes"